Looking for a good startup piano for your child to begin on? Heading online will provide you with lots of opportunities to find used pianos. Unfortunately, finding a “diamond in the rough” can be difficult at best. If you purchase nothing more than a piece of junk, your child will never have the opportunity to understand what it’s like to create beautiful music. If the piano doesn’t sound right, there will be little to hold her attention. Private sellers simply want to get rid of their pianos. 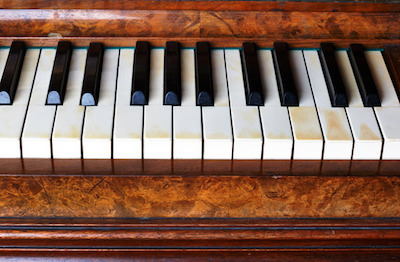 With just a few questions, here’s how you can protect yourself from purchasing a bad piano. This may sound like a question many private sellers would hide behind, you’d be surprised at how much sellers are willing to give. Do they say things like: its sat in my garage for years, I just want more room? This is a sure sign of neglect. If they haven’t taken care of the piano, there is no way it’s going to be in tune, and create a great sound when you sit down at the keyboard. This gives you insight into how knowledgeable a seller is about the piano. How long have they owned it? Do they know the history? You can also use this to judge the history. If it’s just a few years old and it looks like it’s been around for a century, it’s probably not in the best working condition. There’s a difference between allowing kids to bang away on it, or an adult using it to play and relax every day. Has the piano been well maintained? If someone cares for their piano, they will quickly provide you with a maintenance schedule and all the steps they took to maintain it and keep it in good working condition. They may even have suggestions about technicians they’ve used to tune their piano in the past. They will also tell you if they’ve ignored maintenance, meaning the piano probably hasn’t been tuned in years. How often has the piano been moved? Not everyone uses professional piano movers. Regular movers don’t understand how to move this bulky, sensitive instrument. If a piano is moved frequently without the proper support, the internal workings of the piano are more at risk. You’ll often pay a lot more for private pianos than you would from a dealer. Dealers know a piano’s worth. A private seller always feels a piano is worth more than it is, because of memories. And if they don’t charge anything at all – that’s probably the most telltale sign of neglect. If they don’t care about it, they haven’t done much with it. And that means it’s not going to play very well. Want a quality instrument your child will love playing? Start with the best. It’s the best way to give them a chance at loving the art of making music for life.